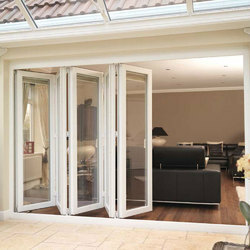 Manufacturer of a wide range of products which include slide n fold door, main door brown colour and amd slide n fold door. This unique system joins multiple door panels with a sliding and folding mechanism and delivers tremendous flexibility for large-scale openings. When closed, Slide/Fold doors appear to be a wall of beautiful hinged doors. Fold open the doors and the wall virtually disappears leaving an unobstructed opening. When closed, Slide/Fold doors appear to be a wall of beautiful hinged doors. Fold open the doors and the wall virtually disappears leaving an unobstructed opening. A single door on one end of the group can be used as a standard hinged door for easy access when only one door needs to be in use. Heavy-duty, multi-point locking hardware brings it all together for ease of opening, folding and sliding. We are the leading supplier of MAIN DOOR BROWN COLOUR made available to our clients at competitive prices.